President Hassan Rouhani has called for “serious and substantive” negotiations with the international community about Iran’s nuclear programme. At the first news conference since his inauguration on Sunday, Hassan Rouhani said he was confident both sides’ concerns could be resolved in a short time. But a solution could be reached solely through “talks, not threats”, Hassan Rouhani added. The US has said Hassan Rouhani’s presidency presents an opportunity for Iran to resolve the world’s “deep concerns”. “Should this new government choose to engage substantively and seriously to meet its international obligations and find a peaceful solution to this issue, it will find a willing partner in the United States,” it added. Western powers suspect Iran is seeking to develop nuclear weapons, but Tehran insists its nuclear programme is entirely peaceful. Iran has repeatedly rejected demands by the so-called P5+1 – the five permanent members of the UN Security Council plus Germany – to halt uranium enrichment. 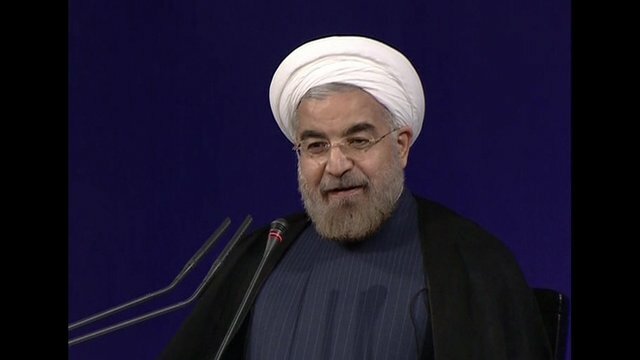 Addressing domestic and international journalists in Tehran on Tuesday, Hassan Rouhani stated that Iran’s uranium enrichment programme was peaceful and legal and would continue. But he also said he was determined to resolve the long-running dispute. Hassan Rouhani said the US still did not have a thorough and proper understanding of what was happening in Iran, and that it had not responded in an “appropriate and practical” manner after June’s presidential election. “[Washington’s] behavior and words are contradictory,” he said, adding that there was a “war-mongering group” there opposed to talks which was taking orders from a foreign country – presumably a reference to Israel. Russian Foreign Minister Sergei Lavrov welcomed Hassan Rouhani’s call for negotiations. “We absolutely agree with what he said. Resolving this, like any other issue, must be not on the basis of ultimatums, but based on a respectful attitude to a partner,” he told reporters in Rome. Earlier, Sergei Lavrov’s deputy said a new round of talks between Iran and the P5+1 must not be delayed and should take place by mid-September. On Sunday, Hassani Rouhani presented to Iran’s parliament, the Majlis, a new cabinet dominated by technocrats who had previously served under a moderate former President, Akbar Hashemi Rafsanjani. Hassan Rouhani also vowed at Tuesday’s news conference that his government would be accountable and act transparently. He said he would keep his promise to “report on the progress made and the achievements, as well as the shortcomings and failings”. “Without the people’s support, the government will have no chance of meeting its long-term goals,” he warned. Hassan Rouhani has inherited a range of problems from his predecessor, Mahmoud Ahmadinejad, including high inflation, diminishing revenues and foreign reserves, possible food shortages, as well as sanctions.